NetSuite is an ERP with endless possibilities, but it may be a little confusing if you don’t where to start. That’s why our team put together a webinar to introduce you to NetSuite and explore its competitive functionalities and short (100 days or less) implementation time for rapidly growing businesses. In case you missed our webinar, we’re going to run you through the highlights of our NetSuite ERP walkthrough. This will give you a great starting point if you’re new to NetSuite ERP. If you want the complete, in-depth experience, you can catch the full webinar here. NetSuite is packed full of features to satisfy the needs of a variety of different users. The first step when it comes to learning how to use NetSuite is understanding what type of user you are, and what needs you are looking to satisfy. In our webinar, we run you through all the types of NetSuite users and the tools that best relate to them. Consumer-based UI makes for streamlined and intuitive user experience, ideal for users of all experience levels. Build your own experience by customizing NetSuite features, like the dashboard, to suit your needs. Find out more about the new NetSuite dashboard here. Configure business rules and integrate apps based on your needs. Build Screens, tables, and fields to visually display and analyze data. A robust full development environment offers developers a range of customization opportunities. Product life cycle management helps you keep track of the progression of your products. Administrators can have complete control over any customizations. Management of roles and security allows for an extra level of control. Access to features directed towards governance, risk management, and compliance. NetSuite allows executives to gain transparency into all processes. SuiteCloud Developer Network is available as an advanced feature. Access to apps for customers & a marketplace for publishers (SuiteApp.com). Different industries have different needs and pain points - so there can be no “one size fits all” solution. That’s why NetSuite offers specialized modules targeted towards different industries. For a more in-depth introduction to NetSuite, check out our full webinar! 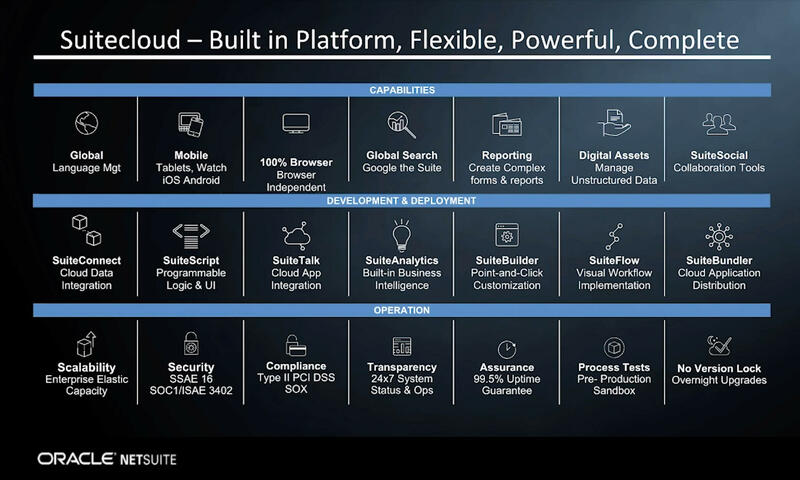 SuiteCloud is NetSuite’s built-in platform. It is flexible, powerful, and offers a variety of useful features. If you’re looking to implement NetSuite in your company, then GURUS is the implementation partner for you. GURUS' dynamic team of business and technical professionals set the standard for best practices in the implementation and customization of NetSuite. We work with business to bring their corporate processes to the cloud, resulting in unmatched productivity and efficiency. The methodology we use throughout the implementation is based on 14 years of accumulated NetSuite experience and built up knowledge. Our Strategic Phased Approach gives you control over what gets implemented first, as well as the timeline of the Go-Live. Our implementations involve a workshare methodology. Our team establishes a strategy with your team to balance the workload. Our team boasts expertise in various industries to meet the requirements of all our clients. 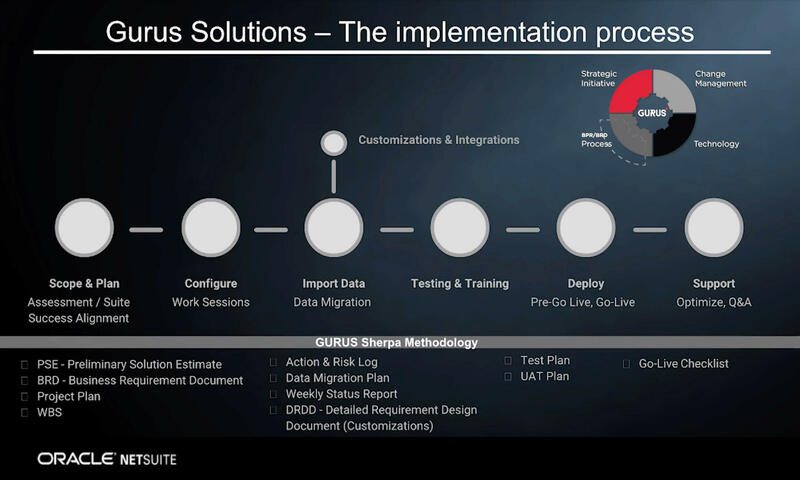 Click here to learn more about GURUS’ implementation process, or check out 5 NetSuite implementation steps for a successful project.